When in Manila, don’t miss out on the local food! Filipinos love to eat and it shows in the way we eat practically five times a day. 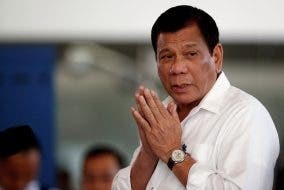 Food is an important part of our culture—it is the centerpiece in various celebrations and it is vital in how we welcome guests, especially foreign travelers who have never been to the Philippines. 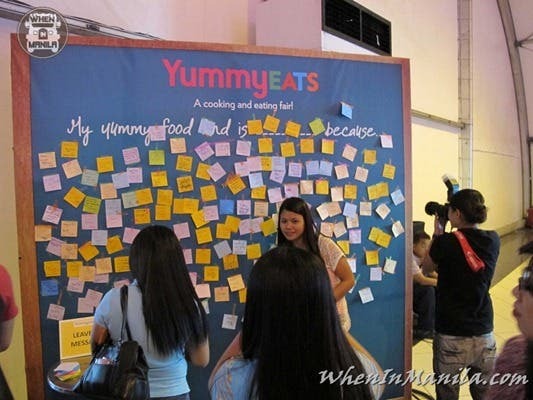 As a self-confessed foodie, I make it a point to check out new restaurants in the scene and to attend food-related events like the YUMMY Eats: A Cooking and Eating Fair. It was the first time that YUMMY Magazine organized a big food fair like this. 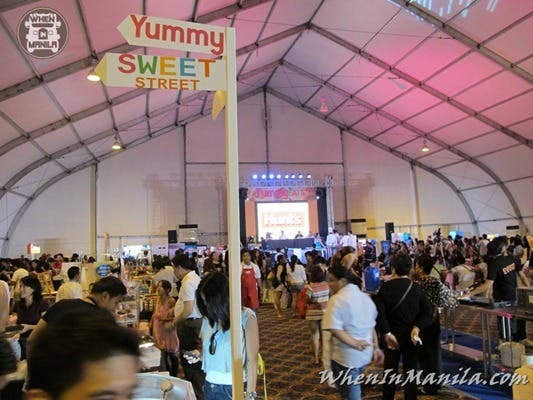 There were 31 concessionaires inside the NBC Tent doing food sampling, and people were treated to a cook-off, cooking demonstrations from Hunt’s, McCormick, and Sarangani Bay Prime Bay, and talks on kitchen safety and new food business ideas. 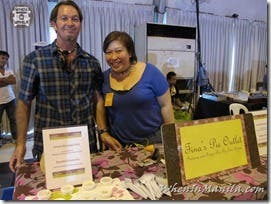 I arrived at the food fair in the middle of the afternoon—just in time for merienda. As I walked to the NBC Tent, I was surprised to see a Fruits in Ice Cream trunk in the middle of the driveway. People were on queue to get a free sample from the delicious ice cream brand. Each guest had a choice of either raspberry or lemon crumble yogurt ice cream. Well, that was enough to whet my appetite. 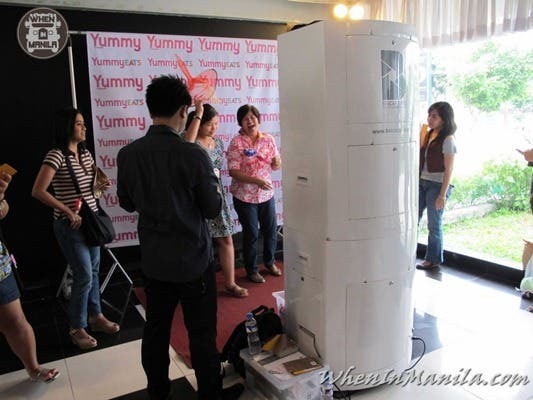 On another corner, there was a photo booth where guests stood in line so they can get a nice souvenir from the event. I’m not really the photo booth type of gal so I just headed inside the venue to find new food discoveries. My plan of action was to focus on desserts to satisfy my sweet tooth. For me, a meal is never complete without a sweet ending. But since I arrived there in time for an afternoon snack, I passed by all the booths to check out what’s new in the food scene. 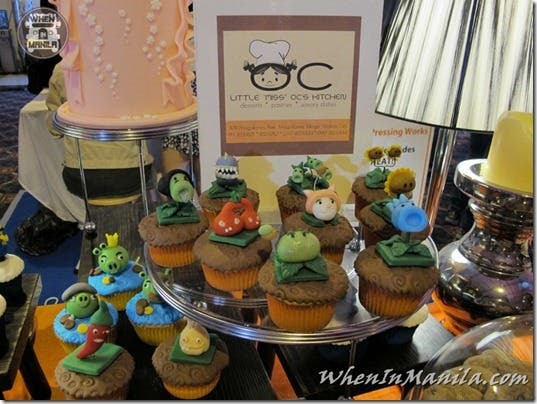 The event featured a wide variety of food fare—from the more established ones such as Starbucks to the up-and-coming home bakers like Tina’s Pie Outlet and Divine Desserts. 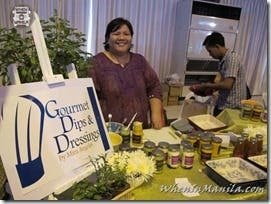 There were also savory stuff like General’s Lechon and Pipino Vegetarian. 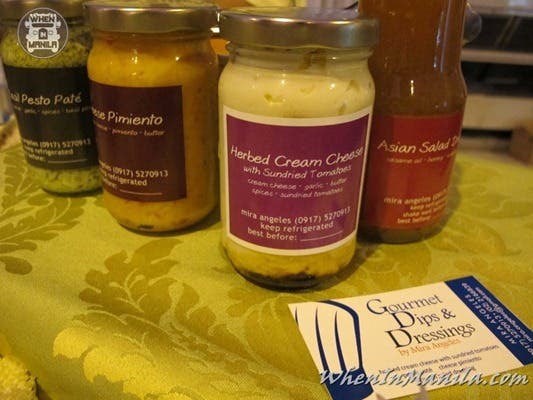 This was a nice venue to sample different kinds of food and I came across some products that have made an impression on my discerning palate. Probably the best thing I’ve tried there was Amaya’s Frozen Caramel. 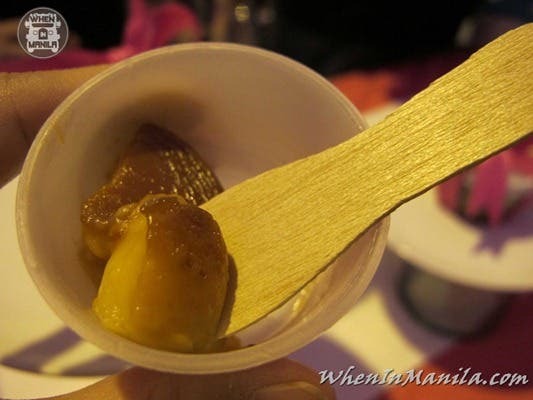 Imagine an extra creamy and cold version of leche flan… Mmm… This sinful treat really melts in your mouth. 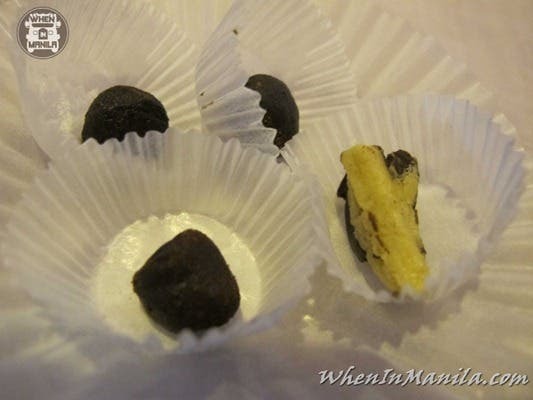 The consistency is very rich and velvety. A little serving of it goes a long way, but you’ll be craving for more afterward. Trust me. Mochiko has become popular with its wide selection of mochi ice cream, which is actually a ball of ice cream enveloped in sticky rice. The mochi is made with premium quality Fruits in Ice Cream products, and is best eaten a couple of minutes after removing from the freezer. The black sesame flavor is worth a try. Relatively new on the ice cream scene, Merry Moo has tickled the taste buds of many with its delicious artisan ice cream. It offers unique flavors like sea salt caramel and earl grey tea. Another must-try is the herbed cream cheese with sun-dried tomatoes from Gourmet Dips and Dressings. The cream cheese dip is made more scrumptious with bits of sun-dried tomatoes in every bite. It is best paired with plain crackers to counteract the richness of the dip. 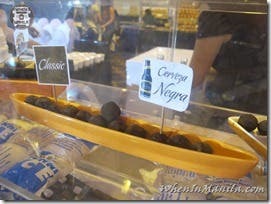 I had a chance to nibble on some samples from Risa Chocolates, which are worth every calorie. I especially liked the Cerveza Negra flavor that was not too sweet and had a little hint of bitter aftertaste. 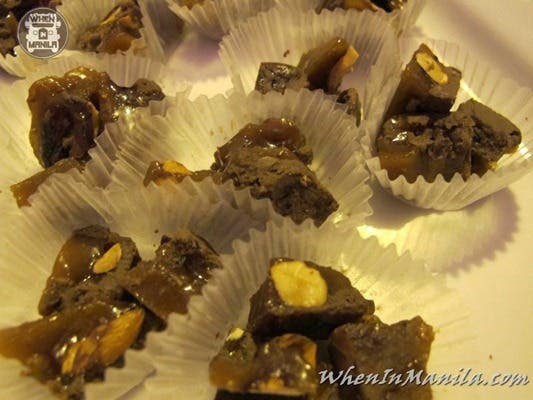 Their other handmade chocolates come in delectable flavors like orange and chewy choco chip dough. Despite going there on an empty stomach, I was not able to sample everything in the food fair, though I enjoyed going to the event and being surrounded by fellow food lovers. Until next time! Nikka Sarthou is a lifestyle journalist who enjoys writing about food and travel. She is a co-founder of Writer's Block Philippines, a Contributing Editor in Smile Magazine, and a Content Editor of OfficiallyPhilippines.com. She was recently featured in Moleskine's "We are Modern Nomads" exhibit. 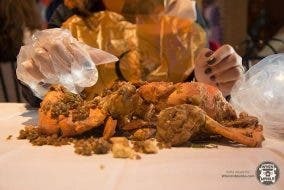 Connect with her online: http://nikkasarthou.com and twitter.com/nikkasarthou. 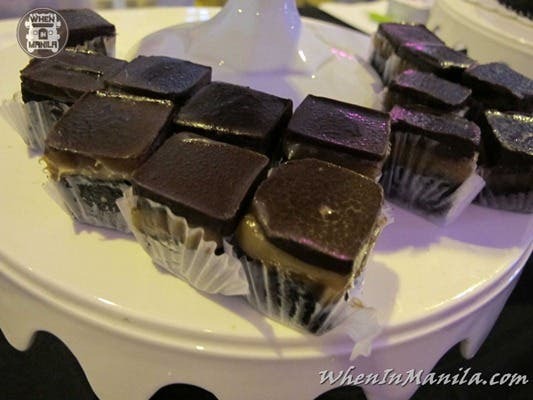 Four Seasons Hotpot & Buffet Cubao Offers 25% Discount to Instagram Followers for 7 Days! Good News to SSS Pensioners: Pension Increase, Approved!